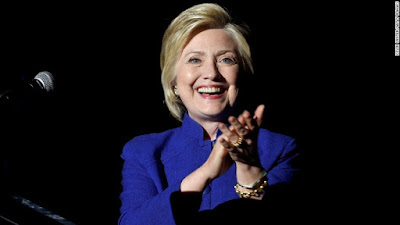 Philadelphia (CNN)--Democrats on Tuesday made Hillary Clinton the first woman to head a major party ticket -- and during an emotional night, her family and supporters asked voters to give her a second look. At the Democratic National Convention in Philadelphia, just three miles from Independence Hall where the nation was born, a sense of history is palpable -- as is Clinton's willingness to finally enjoy it. "What an incredible honor that you have given me, and I can't believe we just put the biggest crack in that glass ceiling yet," Clinton said via satellite after a video montage showed the faces of all 44 male presidents before shattering like glass to reveal Clinton waiting to address the convention from New York. "This is really your victory. This is really your night," Clinton told the cheering crowd. "And if there are any little girls out there who stayed up late to watch, let me just say I may become the first woman President. But one of you is next." The Clinton campaign hoped the day would build momentum and goodwill to repair the deep divides that still linger after her bitter primary duel with Bernie Sanders. The goal is to reshape national perceptions of a candidate with negative approval ratings and who was lambasted last week at the Republican National Convention as a criminal and liar. Former President Bill Clinton weaved a parable of Clinton's work for children, the sick and the disabled into the story of their relationship. More than two decades after Hillary Clinton became a fixture in national politics, Bill Clinton's folksy, sometimes meandering testimony was aimed at revealing a softer side of the Democratic nominee to a nationwide television audience.